Hundreds of thousands went to see the new elevated park next to Seoul Station when it opened to the public last weekend after more than two years of construction. Modeled on New York's High Line, the park, which used to be a drab flyover, drew 151,000 people on opening day Saturday and another 100,000 on Sunday. Warm weather helped to attract the crowds as the mercury spiked at 28 degrees Celsius, but Seoullo 7017, as it is called, has been less lovingly converted than the New York model and is essentially still a flyover with some plant pots on it. The concrete surface 17 m above ground absorbed the heat and reflected the bright sunlight, making it uncomfortable to take a leisurely stroll without eye protection and parasol. There are mist-spraying fountains in 15 spots along the route, but they were not enough to cool the huge crowds. The 1 km path meandering through the park is lined with 24,085 trees and shrubs, but they have been planted in huge planters rather than beds, which create bottlenecks on the 10.3 m wide path that only broadens to 15 m in the middle of the structure. Most of the potted vegetation looked droopy and listless in the scorching sunlight. The park only came into its own after sunset, when the weather cooled and the street lamps created a much more alluring atmosphere. People flocked to the park until 11 p.m., including families with strollers and dogs. The park does offer a breathtaking, panoramic view of downtown Seoul, while the lights emanating from the surrounding buildings added to the urban allure. Some 555 LED lights along Seoullo changed color as the evening progressed, and uplighters under the potted trees make them look romantic in the night. The city admitted that some work needs to be done. Vice Mayor Lee Je-won said, "It will take some time for the plants to grow more luscious. We're going to add more shade and bolster convenience for the public." 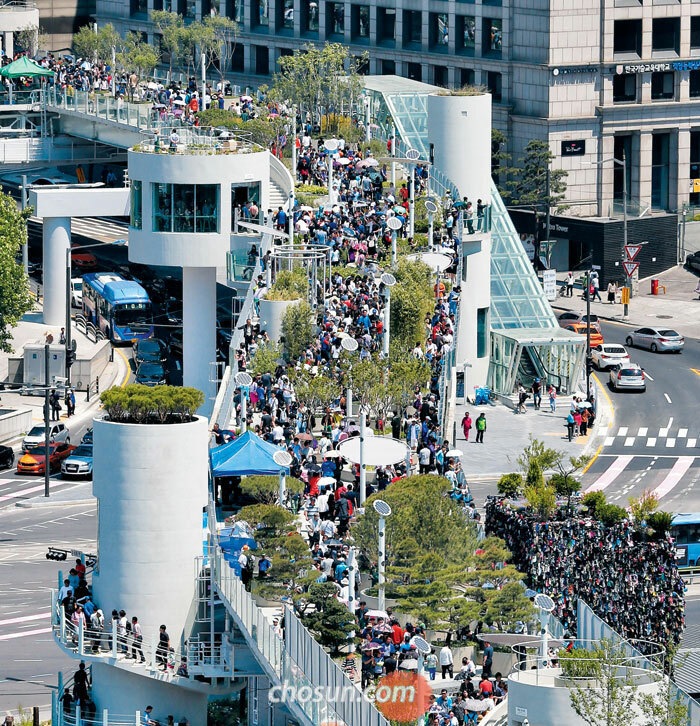 People crowd the newly opened Seoullo flyover park near Seoul Station in the capital on Sunday.